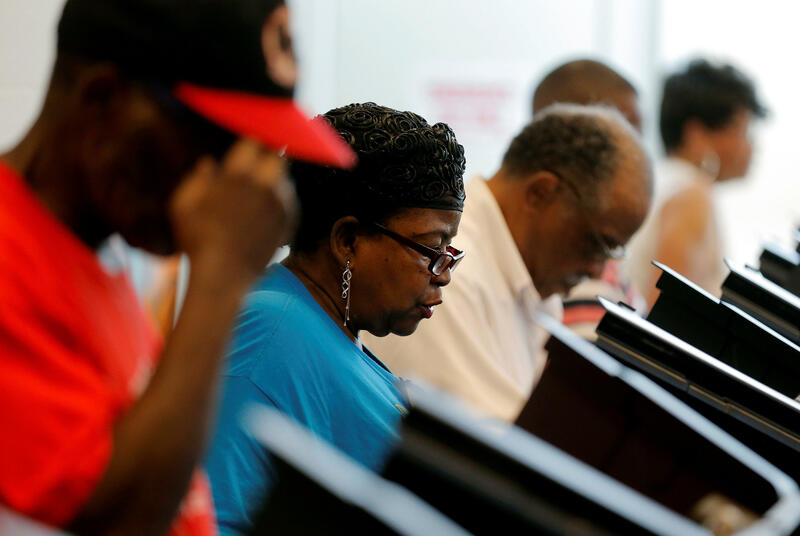 WINSTON-SALEM, N.C. -- North Carolina’s process for challenging voters’ registration seems to harken to a bygone era when fewer safeguards were in place, a federal judge said Wednesday as she presided over a lawsuit that alleges voters are being purged unfairly. Lawyers for North Carolina countered that state data shows only a sliver of names have been removed from county rolls in the past two years - fewer than 7,000 statewide out of 6.8 million registered voters. The judge also said she was “horrified” by the number of removals in Cumberland County, which accounted for the majority of the statewide total. “It almost looks like a cattle call, the way people are being purged,” she told county attorney Rick Moorefield. The hearing ended without a ruling. Biggs didn’t indicate when she would decide but noted time was dwindling before next week’s election. The NAACP lawsuit cites Cumberland, Moore and Beaufort counties, where activists have challenged thousands of voters. The challengers include volunteers with the Voter Integrity Project, which says it wants to guard against voter fraud. In most cases cited by the lawsuit, mail to a voter is returned as undeliverable, which county boards can accept as evidence the voter doesn’t live there. Under state law, any voter can challenge another county resident’s registration, resulting in a hearing where the challenger presents evidence, according to a state legal filing. If local officials find probable cause, the challenged voter is given notice of a subsequent hearing. A voter who doesn’t rebut the evidence can be removed. Elections officials and the challengers say few attend the hearings; many have moved and haven’t updated their registration, while others have died. James Bernier, a lawyer for North Carolina, said a state database shows eight counties removed nearly 6,700 challenged voters statewide in the past two years. A court filing by the state said Cumberland County removed the most - nearly 5,600 - followed by Moore with 790. Beaufort removed 63. However, there appears to have been a recent uptick. At least 4,500 challenges were filed in the three counties in August and September, the State Board of Elections told the NAACP in a letter. It doesn’t say how many challenges were successful. The U.S. Justice Department said in a court filing that if the NAACP allegations are true, they represent violations of the National Voter Registration Act. The NAACP lawsuit comes during a protracted battle over voter access in the state. In July, a federal court struck down much of a 2013 elections law, saying the GOP-controlled General Assembly had disproportionately targeted black voters. The ruling lengthened in-person early voting by a week and eliminated a provision requiring photo ID for in-person voting. That ruling sparked disagreements among local Democratic and Republican election officials about the number of sites and hours for early voting. Through Tuesday, blacks’ early voting participation in North Carolina lagged behind the same point in the 2012 election by 13 percent, according to Catawba College political scientist Michael Bitzer. Black voters have regained some ground since more early voting sites opened last week, but he said it’s unclear if they can close the gap before early voting ends Saturday. Bitzer believes the difference is largely due to less enthusiasm for Hillary Clinton’s race against Donald Trump than for President Obama’s 2012 re-election, but the uneven rollout of early voting sites also contributed. He said he wasn’t familiar enough with the new NAACP allegations to weigh their effect on turnout. “I have to think at this point it’s the top of the ticket,” Bitzer said. “Without Barack Obama on the ballot, black voters may not have that necessary energy and enthusiasm” to equal their 2012 turnout.